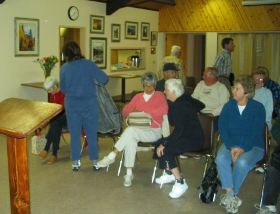 At the Fourth Annual General Meeting of the June Lake Historical Society on August 2, 2012, Mr. Norm DeChambeau spoke on the history of the Mono Basin. 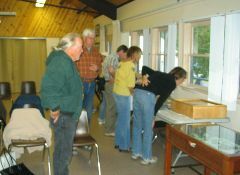 DeChambeau was a local Icon who in his retirement had become President and Curator for the Mono Basin Historical Society. His talk is contained in the video below, and is quite fascinating. Mr. DeChambeau passed away in May of 2016. My grandmother, Dolores Stuart, owned the June Lake Liquor Store sometime in the 1930's and 40's. Back in the 30's and 40's the state of California allowed some gambling in the state, but left it up to the counties to decide what they would allow. Mono County said that it would allow Draw Poker and Slot Machines, as long as they were not in Bridgeport [the county seat]. Right about 1945, Ron Dunn's father Louis Dunn, Bill Treglown [owner of Bills Grill] and Jim Bowen bought out the small operation of Ted Bloomer, an d started Mono Amusements co. They built this up to about 150 slot machines and had them in all the places they could in the county. Late in 1940 or early 1950 the powers to be in Sacramento claimed that slot machines were no longer legal, so they sent several Limo's over and conficated all the machines that they could carry. 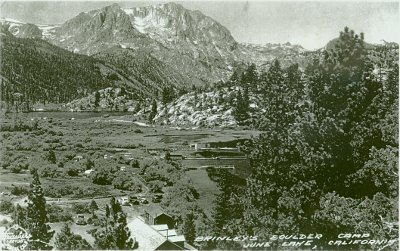 The rest of the machines were destroyed, dumped into June Lake and the dump. No monies from the conficated machines were ever returned to Mono County, as required by law. A neighbor of the Dunn's was Chuck Addison, who was 1/4 owner of the Pioneer Club in Las Vegas , and also Joanne Ronci's grandfather told Ron's dad " There's no way that it can be proved, but Nevada interest’s wanted to stop gambling in California so we got a lot of cash together and Bought BROWN " who was the Attorney General of California at the time to clean up the State. Ron donated several change coin bags that were used for picking up slot change and percentage allowances. Ron was a slot machine mechanic for about 10 years. The small old building north east of the Sierra Inn was used as a slot machine workshop. Ron said the machines came from the manufacturer set to pay 60%/40%. 60% went to the customer who normally put the 60% back into the machine.